Blowout Sale! Save 75% on the Waterproof Pet Heating Pad,Electric Adjustable Warming Dog Cat Heating Mat With Chew Resistant Steel Cord and Power-off Protection 17.7''x17.7'' by COVO at Animal Lovers Center. MPN: 43237-2. Hurry! Limited time offer. Offer valid only while supplies last. Product descriptionA better pet heating pad provides a warm and soothing place for your pet to sit or sleep. With strict electrical safety standards. View More In Terrarium Heat Lamps & Mats. A better pet heating pad provides a warm and soothing place for your pet to sit or sleep. With strict electrical safety standards. Low and safe voltage,Power-off Protection Temperature Control,with a chew guard around,double safe guarantee.better use for your dog beds/cat beds,houses, warehouse or the living room. 1,Please do not fold the heating pad when you use. 2.Don't use it if it is damp. 3,It is waterproof but please do not wash it with water. 4,Switch off the pad when you are not home. 5,Do not use the heat pad without the cover.place an object such as a pillow or fleece cover the heating pad. 6,Inspect the heat pad regularly,in order a Longer life. 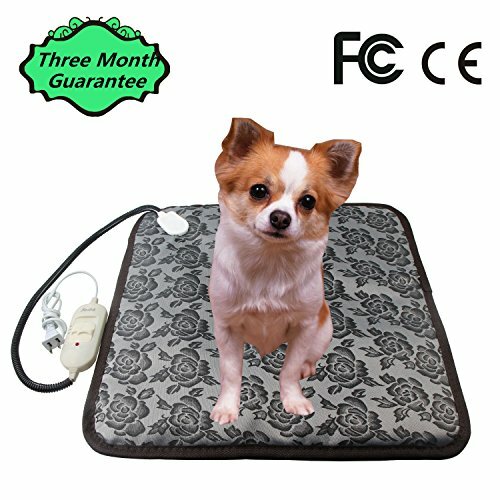 [Warmer Heating Pad for Newborns Dog and Cats]:2018 New Style pet heating pad is not only great for keeping newborns warm,but also the best choice for elder pets,pregnant pets,and animals recovering from illness or injury.Help your pet live a warm winter. [Waterproof & Moisture-proof Materail]:Durable Waterproof oxford fabric material for long- lasting, flexible, anti-electric shock (ensure your pet's safety), easy to clean by machine or hand. Good for dog houses, warehouse or the living room.Size approx 17.71*17.71 inch/45cm*45cm. [Chew Resistant]There is a chew guard around the end of the cord.A good Chew Resistant Steel Cord which can protected our pets cannot easily chew it up. [Power-off Protection Temperature Control]:High/Low level of temperature control.Temperature can be adjusted and can be up to 104 degrees Fahrenheit. It can avoid overheating to protect your pets. [Safety Instruction and Guarantee]:Please keep the pet heating pad flat when in use, Please do not fold the heating pad when you use.We offer Six Month Guarantee,if you have any concerns during using,pls feel free to contact us at any time,we will solve it in the first time. If you have any questions about this product by COVO, contact us by completing and submitting the form below. If you are looking for a specif part number, please include it with your message.